Cerenia There are 4 products. 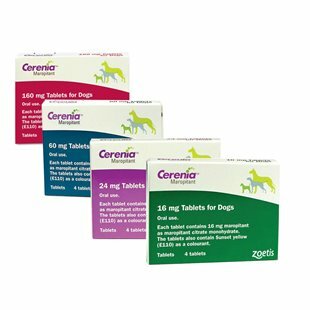 What are Cerenia travel sickness tablets for dogs? Cerenia tablets are used to treat vomiting in dogs and prevent travel sickness. Cerenia dog tablets are POM-V (prescription only medicine) category medicines and as such can only be dispensed upon receipt of a valid vet prescription. Cerenia contains the active ingredient, Maropitant. How do Cerenia tablets work? Cerenia tablets work in the brain as an antagonist of substance P at the NK1 receptor and is effectie against vomiting caused by central and peripheral stimuli. Cerenia tablets are often used in the clinic in cases where other medicines such as metoclopramide or emeprid have not been effective. Cerenia can be injected (although this can sometimes be a little uncomfortable for the patient) or given as oral tablets. When are Cerenia tablets given? Cerenia can be given when dogs start vomiting for a number of reasons. The majority of the time, dogs start vomiting when they eat material they find on walks. This vomiting is often short-lived and cerenia can help get the dog better, faster. Cerenia can also be given in cases of pancreatitis, gastritis, infection (e.g. parvoviral infection or pyometra) or at the same time as cancer chemotherapy to reduce occurrence of vomiting. Cerenia is given at a dose rate of 1mg/kg if injected subcutaneously, 2mg/kg if given orally or 8mg/kg for the treatment of travel sickness. Very occasionally, cerenia can cause transient vomiting when given at the higher dose rate. This can be overcome by administering the medicine with a light meal.